I’ve written a number of pieces about Giacchino over the years but this was one of my favorites. Another in Variety‘s series of “Billion Dollar Composer” sections, it offered a chance to place his career in a bigger context; the main story recounts his own background and sprinkles in quotes from directors J.J. Abrams and Brad Bird (and adds 10 favorite career moments as chosen by the composer). There are sidebars about scoring video games and theme-park rides, and a really fun piece in which frequent collaborators Abrams, Matt Reeves and Damon Lindelof talk about his contributions to their films and TV shows. 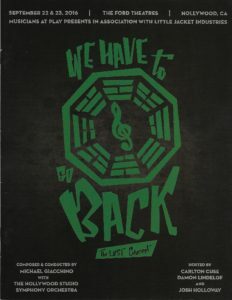 Incidentally, here is a 2009 Variety story focused specifically on his music for Lost and my 2011 visit to the scoring stage for Giacchino’s Super 8 (when Steven Spielberg happened to show up). This entry was posted in Composers, Film Music, From the Files, Interviews, Television Music and tagged Brad Bird, Damon Lindelof, J.J. Abrams, Lost, Matt Reeves, Michael Giacchino, Steven Spielberg, Super 8, Up, Variety on October 12, 2010 by Jon Burlingame.